Each April the Arts Quad at the University of Washington puts on a show. The quad frames the show with a sharply defined rectangle of Collegiate Gothic architecture, as seen in the lower center part of the aerial photo below. The Liberal Arts Quadrangle, more popularly known as the Quad, is the main quadrangle at the University of Washington in Seattle, Washington. It is often considered the school’s trademark attraction, especially in the spring. As you can see from the aerial, the University of Washington has managed to maintain a luxuriously landscaped campus, even given the on-going pressures for adding more buildings as the enrollment grows and new programs enter the curriculum. This landscaping frames your entrance to the quad and your first view of the Yoshino cherry trees that are the stars of the show. Yoshino cherry (染井吉野 Somei Yoshino) is a hybrid cherry of between Prunus speciosa as father plant and Prunus pendula as mother. It occurs as a natural or artificial hybrid in Japan and is now one of the most popular and widely planted cultivated flowering cherries in temperate climates worldwide. It is a clone from a single tree and propagated by grafting to all over the world. The cherry trees were bought by the UW in 1939 and initially planted at the Washington Park Arboretum. The trees were moved onto the campus’s Liberal Arts Quad in 1962 after construction began on State Route 520, which cut across part of the arboretum. In 2014, an additional 32 trees were donated with funds from the Japan Commerce Association and will be planted at Rainier Vista and in the arboretum. As you pass between the buildings and into the quad, the cherries envelop you. As is obvious, there were a few other people there to see the trees as well. And everyone had a camera or phone camera to capture the color – or each other. The north-east end of the quad sits at a slightly higher elevation and was the final portion to be added with the construction of the Art and Music Buildings. These two buildings, each with towers, act as a grand gateway for those descending the 3-tiered stairway. This is the Art building, in a photo taken a week earlier, before the blossoms really started to put on a show. Here’s the framing Music building, where someone slipped a magnolia into the cherries. Standing at the top of the stair gives the best overview of the quad. Wandering around under the trees offers an endless variety of photo opportunities. But – not everything is about cherry blossoms. For some people, with other important things going on in their lives, they’re just a nice background. There were a number of people taking wedding-related photos. But for many, it’s just a pleasant day to walk around the quad and enjoy the ephemeral quality of this annual show. It may seem odd to write about snow in the winter time, especially in the mountainous state of Washington; but, surprisingly, in Seattle, along temperate Puget Sound, snow shows up only every 5 years or so. Mostly, our snow comes as rain. The real stuff coats the Cascade and Olympic mountains. Then, every so often we wake up to a surprise. This view normally shows downtown Seattle framed dramatically by Mt. Rainier; but today the Space Needle at the Seattle Center barely shows up, with the downtown skyscrapers ghosted in as a background. We have a popular ‘overlook’ walkway around this part of Queen Anne hill; and the occasional person was out enjoying it. The various ‘hillclimbs’ that run perpendicular to the overlook didn’t draw much traffic though – the footing was tricky. but the Japanese cherry trees were less certain. Luckily for the Junkos, though, the bird lady was on the job with extra seeds. As for the rest of us, we celebrated that the local Bakery and Coffee Shop were open. Harley Cowan, a friend of mine from our days at Washington State University, is also a historian when it comes to his home town of Richland, Washington. On top of that he also practices the art of photography using traditional, archival, black and white photography. Using these skills, he photographed and wrote about the Hanford Nuclear Reservation, along the Columbia River, in central Washington State. 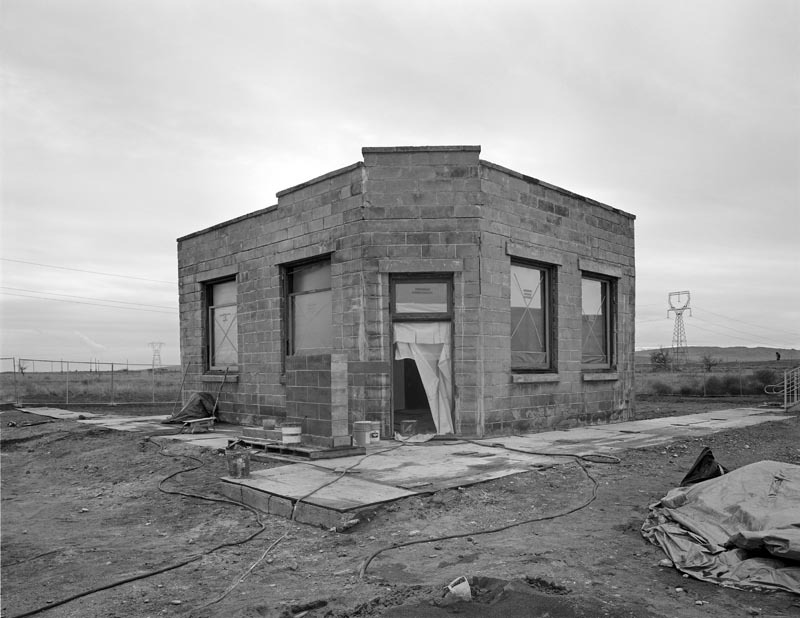 His work was published by the Washington Trust for Historic Preservation. I thought his effort merited a wider audience. Read on ! The loading face of B Reactor, the world’s first full-scale nuclear reactor. I grew up in Richland, Washington, next to the Hanford Nuclear Reservation. 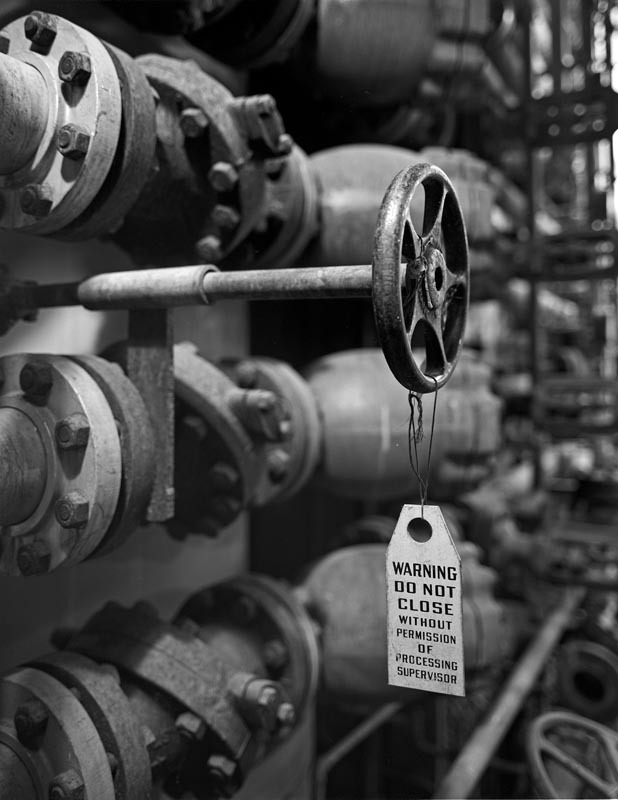 In March of 2017, as part of a research fellowship on heritage documentation, I had the opportunity to spend a week photographing the newly established Manhattan Project National Historical Park. I was there to make a contemporary record of B Reactor (1944), the world’s first full-scale nuclear reactor which produced plutonium for the Trinity Test in New Mexico and the Fat Man bomb dropped on Nagasaki, Japan. Arguably the greatest engineering feat of the 20th century, and the most terrible, a Promethian altar of science, the B Reactor has long held a fascination. So what is heritage documentation? Following the Great Depression, Roosevelt’s New Deal created a number of make-work programs including the Works Progress Administration, the Farm Security Administration, and the Civilian Conservation Corps. 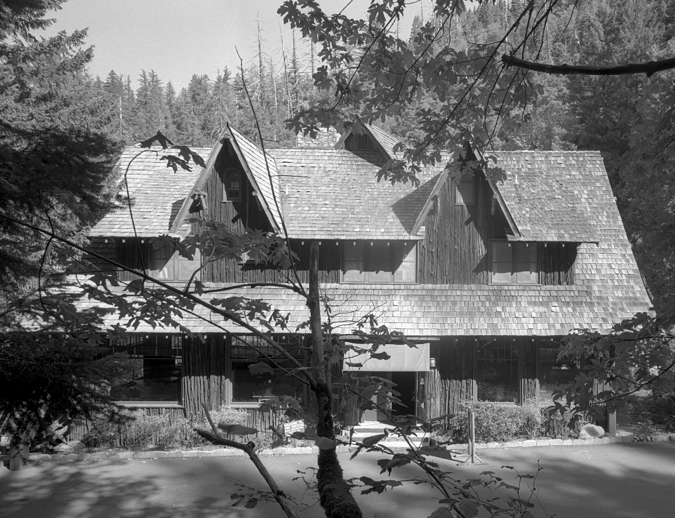 Since 1933, the National Park Service has administered one such program, the Historic American Buildings Survey (HABS), which documents and catalogues American architectural heritage through written histories, measured drawings, and photographs. While most New Deal-era programs no longer exist, HABS remains active. In 1969, the National Park Service added the Historic American Engineering Record (HAER) to record infrastructure, machinery, and industrial history. In 2000, its scope of conservation was expanded again with the Historic American Landscapes Survey (HALS). Together these three are our nation’s Heritage Documentation Programs. Their archives constitute the most accessed records in the Prints & Photographs Division of the Library of Congress. To satisfy the strict requirements of the programs, the Secretary of the Interior laid out standards for photographic documentation which include the use of a large format camera and black and white film. The smaller format cameras most people are used to have a lens centered on and perpendicular to the film or digital sensor. With the large format camera, the lens and the film are connected by a flexible bellows allowing each to be positioned independently. This provides the required in-camera control over perspective and the plane of focus. Additionally, to meet the 500-year archival standard of the Library of Congress, black and white sheet film is used and is processed by hand. 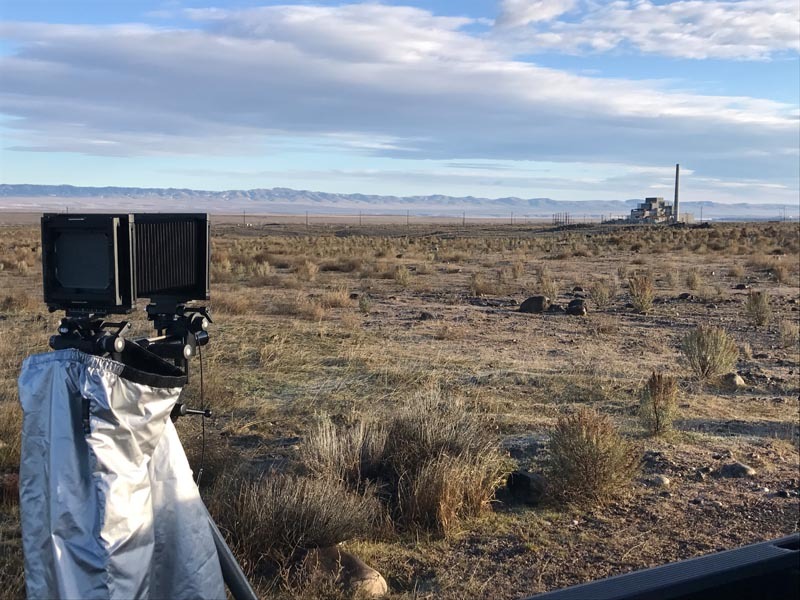 Photographing B Reactor from a distance with a large format camera. Photo by Harley Cowan. 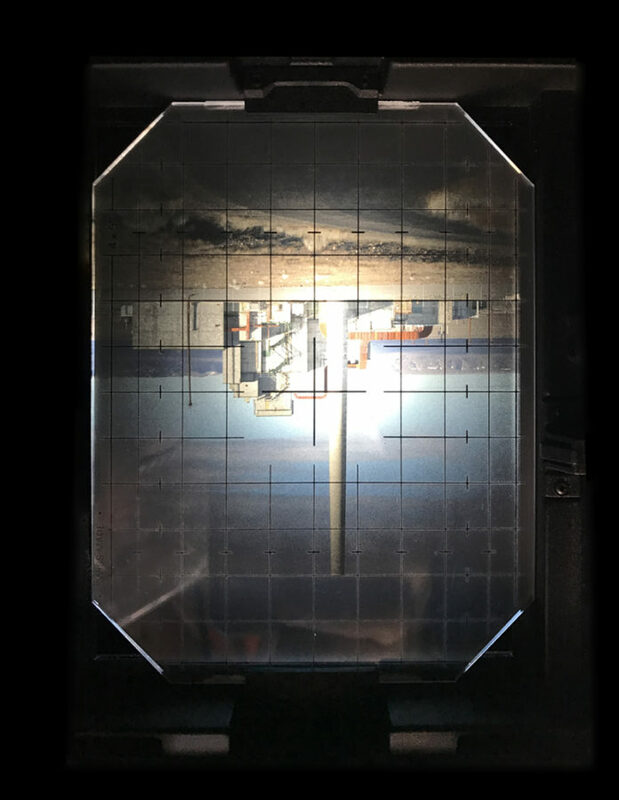 The view through a large format camera. It was with these parameters that I set out to document the B Reactor and environs. Nothing like B Reactor had ever been built before; interpreting its engineering, major systems, and methods of construction was no small feat, especially with only a few days to do so. Fortunately, there were a few things working in my favor: I had visited B Reactor before; I had worked in nuclear industry through high school and college; I am a practicing architect and laboratory planner; and I was a student at the Pacific Northwest Preservation Field School, a program in the theory and practice of historic preservation through University of Oregon. To access the site, I went through a background check to receive my security clearance and identification; portions of the national park are still within the secure boundary of the Hanford Nuclear Reservation. Each day it was about an hour drive from Richland to B Reactor, and I would have to stop and be processed at a secure gate. The Hanford site is a kind of wildlife preserve. Only a small fraction of the land, which is half the size of Rhode Island, has been disturbed by construction. Large herds of elk and deer roam throughout, and it is not uncommon to see rabbits, geese, quail, coyotes, and porcupines. While on Hanford Nuclear Reservation, I had the unexpected pleasure of access to the pre-Manhattan Project sites that are part of the park, including Hanford High School (1916), the Allard Pump House (1908), the White Bluffs Bank (1909), and the Bruggemann Ranch (1907) which was designated by the Washington Trust as one of Washington’s Most Endangered Places in 2018. In the limited time, I was able to take a few general shots inside and out of each building. The floor of the last remaining building at the Bruggemann Ranch is littered with timber and roofing, nails, spark plugs, and rabbit bones. Barn owls were in residence at both the high school and pump house. The bank, the only structure remaining of the town of White Bluffs, was being rehabilitated and afforded me the unusual opportunity to capture pictures of construction work in progress. These kinds of visual records can be extremely valuable to future historians and preservationists. The White Bluffs Bank (1909) is the only building remaining in the abandoned town of White Bluffs. The existing wooden window frames and sashes, thanks to the desiccating climate, were mostly salvageable and were repaired and reglazed. Photo by Harley Cowan. 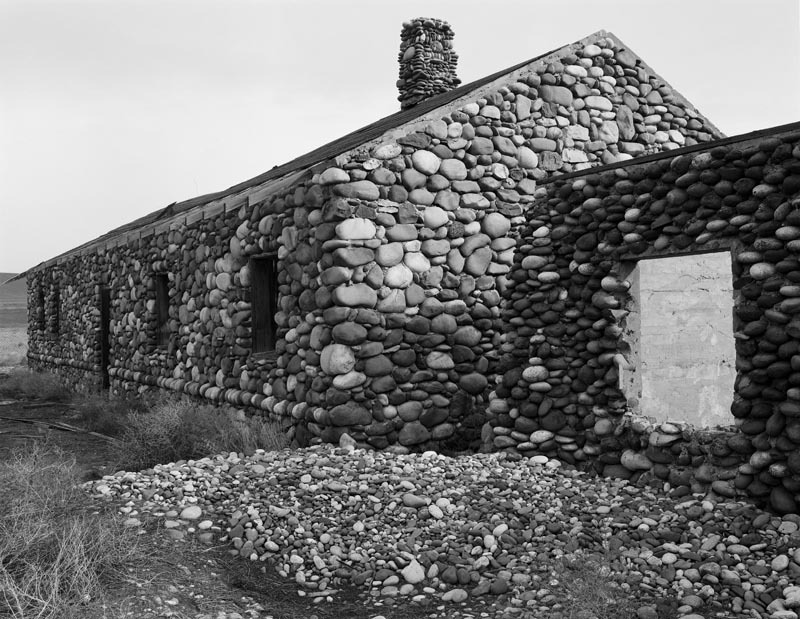 The last remaining building at the Bruggemann Ranch (1907) on the Hanford Nuclear Reservation. West and south façades shown. Photo by Harley Cowan. My visit to the B Reactor occurred outside of the normal tour season which was important in order to make photos without interruption. The public is allowed on the grounds around the site and in most of the ground floor spaces within the reactor building. Some areas like the valve pit are off limits due to their industrial nature, and a few places like the reactor core itself and its control rod and safety rod rooms remain monitored as radiological zones. The building is roughly a three-tiered ziggurat with most spaces spread out around the reactor in the first tier. The graphite core and control rods occupy the space at the center and up into the second tier. 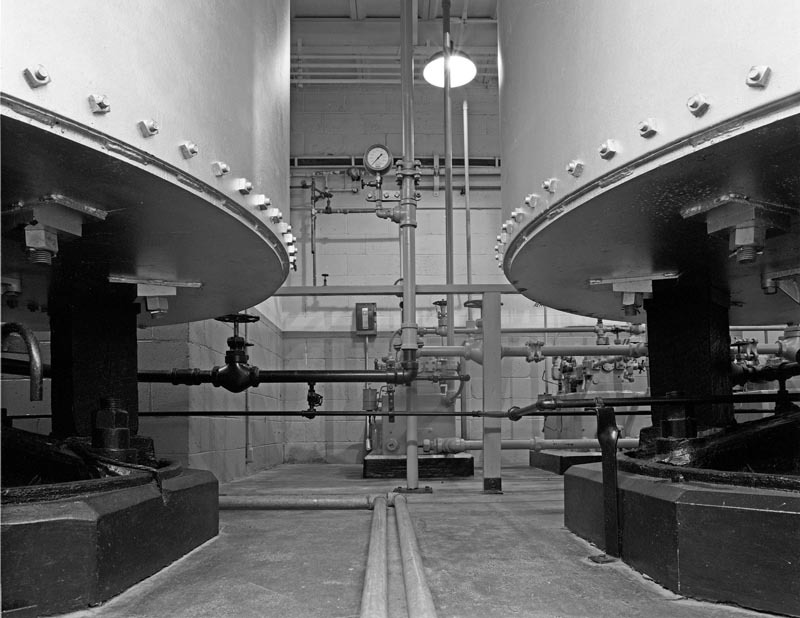 Safety systems sit above the reactor in the top tier. Hidden below grade is a twenty-foot-thick concrete slab. The exterior is a combination of cast-in-place concrete for mission critical elements and reactor core shielding, while concrete block and concrete brick masonry were used in less sensitive areas for expedience of construction. While utilitarian in nature, the shape and sequence of spaces create a dramatic reveal. One enters through a normal-looking door in a block wall and walks through a wide corridor with a concrete floor and block walls painted green and white. Ducts and pipes run overhead, also painted white. Green wooden doors line either wall opening into rooms, shops, and lavatories. At the end is a similar pair of doors beyond which the space opens out and rises up, cathedral-like. 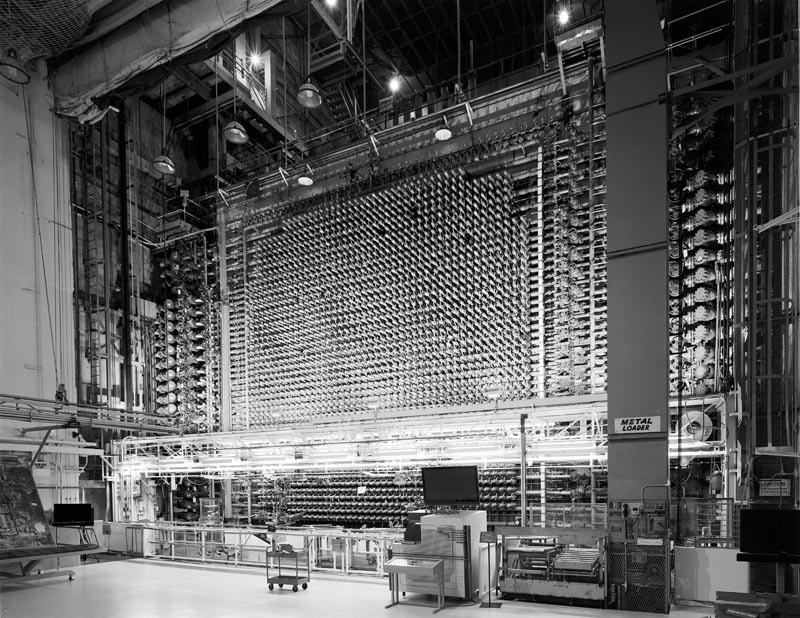 Turning to the left, you are confronted by the expansive, lighted face of the reactor, the ends of its 2,004 process tubes arranged in a grid with enormous standpipes flanking each side and branching off into a rhythm of valves and fittings. The exterior of B Reactor (1944), showing its resemblance to a ziggurat. Photo by Harley Cowan. I spent the next few days exploring the rooms and corridors that are open to the public including the control room, radiation monitoring lab, accumulators and their enormous ballast tanks, electrical and ventilation equipment rooms, the instrument shop, and Enrico Fermi’s office. On my last day, we (myself and two staff from Mission Support Alliance, the stewards of B Reactor) entered the radiological zone to photograph the safety systems which sit above the reactor. The health physics technician performed a Geiger counter check on each of us, along with the camera gear, after which we put on personal protective equipment (PPE) and climbed several steep flights to a room not on the tour route in the upper portion of the ziggurat. During the reactor’s active operation vertical safety rods, long metal tubes filled with boron, were suspended aloft by cables. In an emergency, they would release dropping by gravity into the reactor shutting down the chain reaction by absorbing neutrons. Today, these rods have been permanently lowered into the core. Above the top of the core, we set up on a narrow metal catwalk with pipe railings—not easy with a large format camera. There was not enough room to fully open the tripod. Framing and focusing the image proved to be a challenge. I took four shots but only the first turned out. Unbeknownst to me at the time, the tripod settled slightly, throwing the focus off for all but the first sheet of film. We packed up and hauled out, with a very brief glimpse at the discharge face of the reactor on the way back down. Another Geiger counter check confirmed that we had followed our protocols and were free to return to the public side of the building where I packed up my gear and drove off the Reservation for the last time. The vertical safety rods of the B Reactor which were used to rapidly shut down the chain reaction in an emergency. Each circular hopper contained a sixty foot long safety rod which, during operation, would be suspended by the cables up above the reactor core. Today, these rods have been permanently lowered into the core. Photo by Harley Cowan. A public exhibition of silver gelatin prints will be on display at Allied Arts’ Gallery at the Park (89 Lee Blvd.) in Richland from March 5 through 29, 2019, with an opening reception to be held on Friday, March 8 from 6:00-8:00 pm. 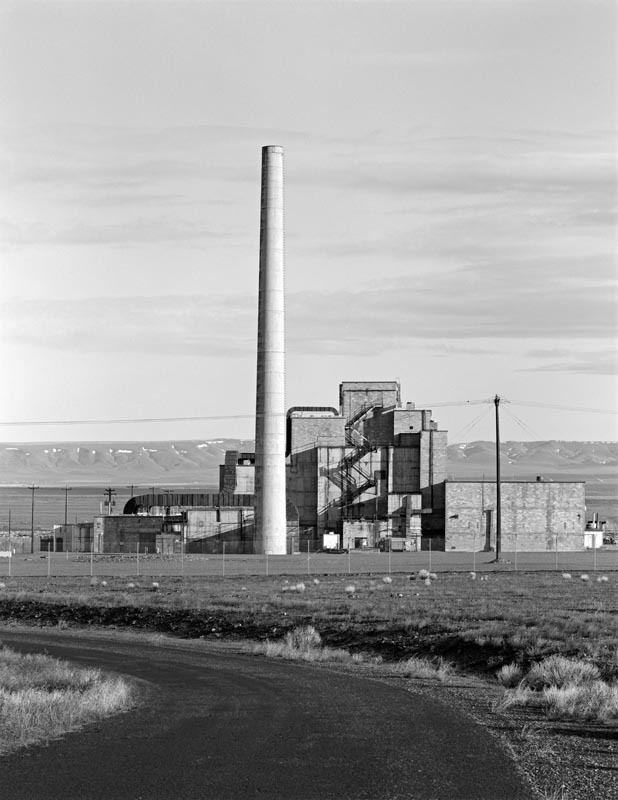 The show will largely feature photography of B Reactor and its engineering and construction, but will also include the Bruggemann Ranch, the Allard Pump House and canals, Hanford High School, and the White Bluffs Bank. Looking at the underside of the ballast tanks and the connection to the accumulators. 4×4 wood posts provide a “soft brake” if the ballast tanks were to crash down in an emergency. The system pumps are in the background. Photo by Harley Cowan. A hand-painted, wooden warning tag prevents workers from closing a cooling system valve at the loading face of the reactor. 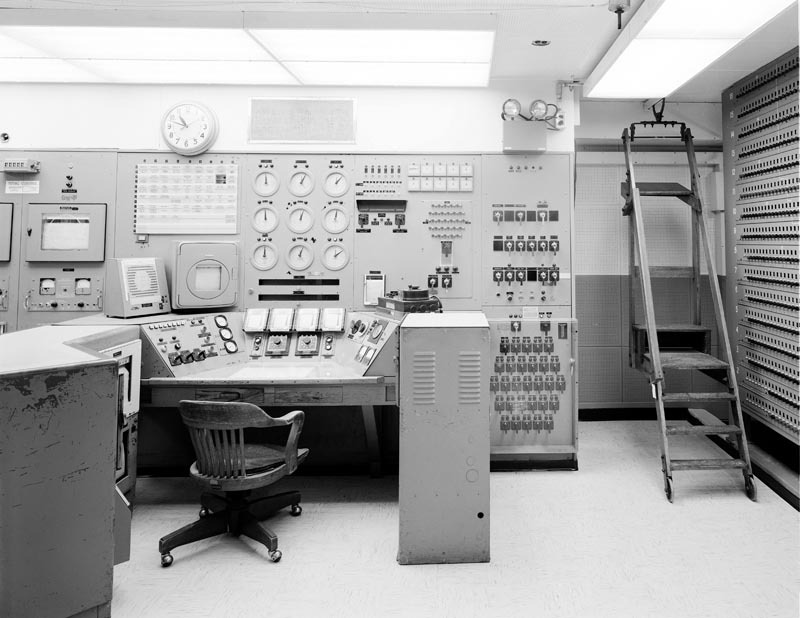 The reactor operator’s console and scram panel within the Control Room inside B Reactor. 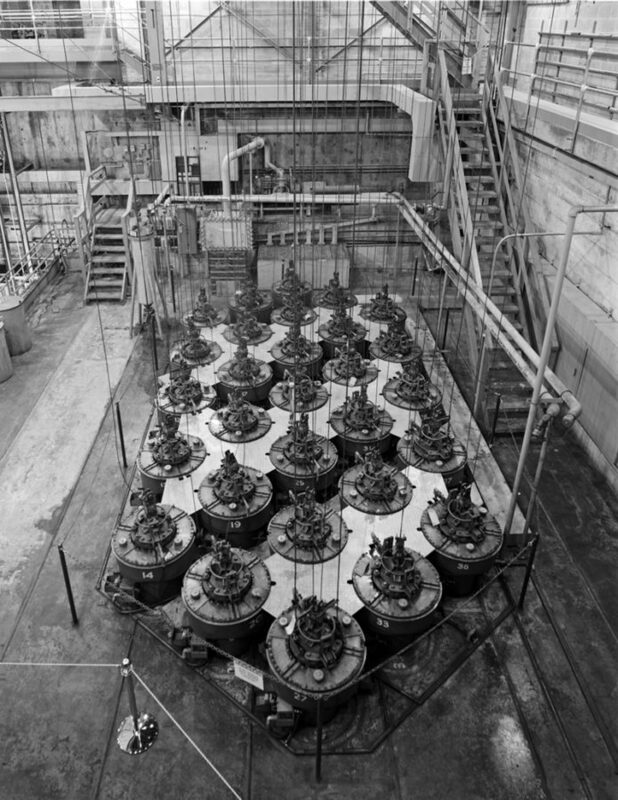 The clocks have been set to the time when B Reactor went critical on September 26, 1944, marking the world’s first self-sustaining chain reaction. This chair is an original, although a different chair is placed here during tour season. We made a recent mid-winter visit to Fir Island in the Skagit Valley, one of our favorite ecological sites, for a variety of reasons. It’s about an hour north of Seattle; and we’ve been there before. You can see that visit here. This time we focused on the area within Fir Island. Here’s a map to give the general layout. The “island” is man-made. It encompasses most of the delta of the Skagit River, a large, flat, triangular area between the north and south forks of the river, that edges Skagit Bay. A smaller portion of the delta still exists along the southern edge; but the bulk of it has been diked (area within the light outline) and developed as very productive farmland. One of the ironies of this man-made intervention is that farmland requires diking along the saltwater edge of the bay as well, which essentially converts the island into a large basin. The catch of course is that all of this relies on “mother” to be calm and cooperative; and occasionally she decides to act up. In one instance, storms can drive waves from the bay into the dikes and wash salt water into the farm land. In another, high water from the river can over-top the inner dikes, essentially filling the basin. As a result, an elaborate system of one-way sluice-valves has been incorporated into the dikes to ensure that water can flow out but not come in. In extreme conditions, high water can breech the dikes – a major disaster. We pulled off the freeway at Conway and stopped briefly to check out the Trumpeter Swans near that small town. We’ve observed that each year there are fewer snow geese and more swans. The swans spread out more and are not nearly so noisy. Since Fir Island is diked along the river, major infrastructure, such as the I-5 Freeway and the Burlington Northern railroad have to travel outside the diked area. We crossed over the railroad and dike and then spent most of our time in a relatively new conservation area along the south fork of the Skagit River – see map above. As is obvious from the photo, this is a “back to nature” area in which tidal salt water can once again flow, fresh water plants and trees are dying off, and new tidal marsh plants are springing up. So it’s not yet what you would expect of marsh; but it also has its own spare beauty. The photo below shows the transition from older to newer plant materials. In areas where the ground level had been lower, shallow tidal bays have formed. Tree stumps get to show off their sculptural qualities but will soon be absorbed by water and moss. Where the process has been under way for a number of years, cattails have showed up (along with redwing blackbirds) along with our king of invasives – African Blackberries – curving through everything else. In some places the trees have been topped. I’m not sure why that was done. providing shallow water for the local fisherman. On the way to find some lunch in La Conner, we stopped at one other location closer to the bay that gave a good sense of the sweep of the geography. A nice way to finish our tour. Tacoma, Washington’s Museum of Glass is a premier contemporary art museum dedicated to glass and glass-making. In addition to growing a permanent collection that chronicles the development of modern glass, the museum also hosts engaging artist residencies, national traveling exhibitions and unique programs for local residents and visitors. The museum was developed by two friends, Phil Phibbs, who had recently retired as president of the University of Puget Sound and glass artist Dale Chihuly who had grown up in a neighborhood near the campus and had attended the university. Museum of Glass – view from the harbor side with the hot shop tower in the background. I had recently visited the museum for the show of Preston Singletary’s work (see that blog post here); but this time I was visiting to watch my grandson, Jack Spitzer, who both works and blows glass in the museum’s hot shop. Jack works there as a member of Hilltop Artists, a non-profit that “uses glass art to connect young people from diverse cultural and economic backgrounds to better futures”. Hilltop Artists runs hot shops at Jason Lea Middle School and Wilson High School as well as a flameworking studio at Ford Middle School. Jack began working with glass at Jason Lea. I arrived during set-up and thus had time to take in the setting and tempo of the work. While most spectators take a seat in the amphitheater, the museum does permit people to circle around the work space on a balcony walkway. I did some of each, finding that multiple viewpoints were needed to be able to clearly see the various glass-handling processes, especially since many of them involve two or three people around the work. After setting out his tools, Jack “gathers” some molten glass from a continuously running furnace (in the background) on a blowpipe and then uses the heat from the Glory Hole – running at about 2000 degrees, to bring it to the right working temperature. A wide variety of techniques are used to shape the glass in addition to blowing through the pipe. Some involve cutting or crimping – above – or rolling on a “marver” steel table as seen below. As you can see from the body language, there’s a lot of comraderie in the teamwork and a fair amount of casual banter. This turns out to be an important ingredient in the success of the work, since in the next piece someone else will be leading and Jack will be assisting. One of the mysteries of glass work for me comes from the fact that often the initial shapes bear little resemblance to the finished pieces. Clearly, the artist has to have something in mind and, most importantly, the steps involved in getting there. When elements need to be added to the initial form, the dance between the two workers begins. In case you haven’t figured it out, there’s a Santa hat developing. Now that the white ball has been added to the hat, the bottom can be opened with tongs as the shape is rolled back and forth against a wet cherry board. It’s easy for the viewer to lose track of how hot that piece of glass still is – and, ironically, for the glass worker to lose track of how fast the glass is cooling down. Occasionally localized heat is re-applied to keep things malleable. Then, when the piece is deemed ready enough, it’s removed to a warming oven to wait for stage 2. At this stage the basic glass gather is first rolled on the marver and then in glass beads that coat the exterior. At a later step it will be rolled across the line of red beads farther up the table to add an accent line. To keep the shape from drooping as it’s worked, Jack rolls it inside a wetted wooden scoop shape that gives it support. In this piece there’s a bit of actual blowing through the pipe, though most of the sculpting was done with tongs and shears. At this point a number of step sequences get repeated – applying heat, shaping with tongs, firming up the form. Now the real sculpting starts, with addition of the head, shaping of the mouth, and addition of the various fins. The fins require individual shaping and crimping. In case you were uncertain, Jack said it was a Chinook salmon. It took several rounds of this to get each fin located, attached, crimped and shaped. Finally, the Santa hat came back out of the warming oven, was placed, heated to soften it for shaping, and fitted over the Chinook. And here he is, ready to deliver presents to all the waiting smolts. One last, not very glamorous but VERY critical step – getting the piece into the oven that will help it cool slowly for a day without shattering. One of the assistants, clad in a heat-resistant jacket and gloves will make the delivery. And at the end, a bit of chatting with family and friends in the audience. Always nice to have a few fans around to appreciate your work. Just so you have a sense that Jack does other things than fish, I’m including a sampling of his work that his mother put together. He’s come a long way in a short time. On a recent visit to the Tacoma, Washington Museum of Glass, we were privileged to experience Raven and the Box of Daylight, an exhibit of work and experiences by native Tlingit glass artist Preston Singletary. Preston Singletary grew up in the Seattle area listening to stories told by his great-grandparents, who were both full Tlingit. In high school he met and became friends with future glass artist Dante Marioni, son of glass artist Paul Marioni. Singletary was asked by Marioni to work as a night watchman at what was then the Glass Eye, a Seattle glass-blowing studio. Singletary quickly moved from being night watchman to working the day shift to eventually joining one of the studio’s production teams. 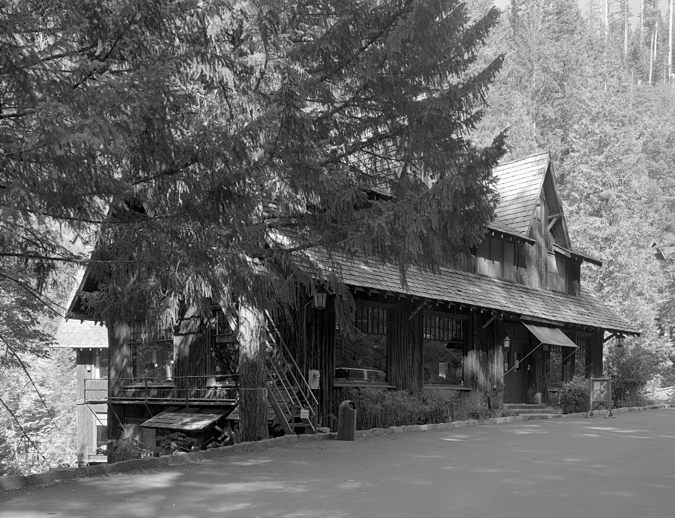 In 1984, Singletary took part in a workshop at Pilchuck Glass School for the first time. He has since been involved in Pilchuck as both a teacher and student. In the late 1980s, Singletary began incorporating traditional Tlingit themes into his work and reaching out to other Northwest Coast Native American artists. Today he is perhaps best known for his use of glass to express and explore traditional Tlingit themes. Many of his works reference clan crests, including the killer whale, which his family claims. Raven and the Box of Daylight is the Tlingit story of Raven and his transformation of the world—bringing light to people via the stars, moon, and sun. This story holds great significance for the Tlingit people. The exhibition features a dynamic combination of artwork, storytelling, and encounter, where the Tlingit story unfolds during the visitor’s experience. Since I hadn’t planned to tell the artwork story in all of its details, I’ll use the story as a framework to illustrate the work that we saw. The story of Raven releasing or ‘stealing’ the daylight is one of the most iconic stories of the Tlingit People of Southeast Alaska. The Tlingit name for Raven is Yéil. Many people know the basic story, yet there are variations unique to specific villages and individual storytellers. Three carved boxes contain Naas Shaak Aankáawu’s (Nobleman at the Head of the Nass River) most prized possessions: the stars, the moon, and the daylight. His grandson, Yéil K’atsk’u asks for the boxes and is told he cannot have them. He cries and cries for the box of stars and eventually his grandfather relents. Naas Shaak Aankáawu gives his grandson the box of stars, which he immediately opens. The stars slip through the smoke hole in the Clan House and take their places in the sky. Naas Shaak Aankáawo is furious with his grandson. He scolds him and Yéil K’átsk’u becomes inconsolable. His crying breaks his grandfather’s heart and he forgives his grandson for what he has done, but the boy still will not be comforted. The boy moves towards the box containing the moon. His grandfather hesitates, but forgives his grandson again. He gives Yéil K’átsk’u the box with the moon. Naas Shaak Aankáawo do Séek’ (Daughter of the Nobleman at the Head of the Nass River), the boy’s mother, does not think her son should have the box and she argues with her father. As they argue, Yéil K’átsk’u opens the box. He plays with the moon and then releases it. The moon silently slips through the smoke hole and takes its place in the sky. The sun is the final treasure. Naas Shaak Aankáawu protects it fiercely, but Yéil K’átsk’u eventually succeeds in releasing the daylight (below). Yéil (Raven) decides it is time to leave and transforms back into bird form. Naas Shaak Aankáawu is devastated that his treasures have been released into the sky. He is so angry that he gathers all the pitch in the Clan House in a bentwood box and throws it into the fire. He catches Yéil as he tries to escape out of the smoke hole and holds onto his feet. Raven is covered in the soot and smoke of the fire. He is transformed from a spiritual being into the black bird we know today. His color marks his sacrifice; his physical form is forever changed for bringing light into the world (below). A number of other elements support parts of the story, such as this ceremonial spear. Portal – similar to those used in long houses. such as this Salmon Woman, obviously an important clan member. The experience of being in the room with all of these clan members was heightened by the treatment of the background, where fabric, gently moved by small fans, was used as a screen onto which were projected images that helped tell Tlingit stories. Overall, a fascinating story and compelling experience.